Also it only took about 2 hours to complete, so you’re just one good holiday movie away from completing this cute project. You could use any color yarn and ribbon, so it doesn’t have to be a holiday wreath unless that’s what you are going for. And this project is so inexpensive (mine cost around $12) that I could see this being a really fun gals’ night craft project or homemade gift you could make multiples of if you wanted. Quick note about yarn for this project: I’d recommend choosing something that isn’t prone to fray much if at all. I also think thicker/chunky yarns look really nice here, and they will make this project come together much faster (you’ll see why in a second). I used 1 1/3 skeins of Yarn Bee yarn in Astounding White (each skein was 43 yards), but see what you can find at your local craft store as I think there are lots of options that would work well here. You could even use jersey yarn or cut up t-shirts into thin strips of fabric for a different look than yarn. The possibilities really are limitless here, but do keep in mind to choose something that doesn’t fray easily. Step One: If you using, spray paint the wire frame. I decided to do this as my original frame was a dark green and I chose to use white yarn. So I wanted the frame to be white in case any small areas showed through the yarn. If your frame already matches your yarn color choice, then you can skip this step. Step Two: Cut one of the skeins of yarn into 7 to 8 inch pieces. This is a bit longer than you will probably need, but it makes it much easier to work with. You will likely need more than one skein of yarn, but it depends how big your wire frame is. So it’s good to just cut one skein, and then wait to see how much more you will need before cutting a second one. Step Three: Loop each piece of yarn over the wire frame and then slide into place. See the images above for how I did this. Repeat until the entire frame is covered in yarn. Step Four: Give your wreath a hair cut! Trim the yarn to the length you desire. Then add a ribbon bow or any other embellishments you want (faux berries, decorative birds, greenery, etc.). You can sew these in place or use a hot glue gun. I chose to sew mine with thread to the wire frame. That’s it—pretty simple! Now you can display your wreath on any door or wall in your home. Mine is currently hanging on the inside of my backdoor. If you do choose to hang it outside, you might consider using a product like Scotchgard Rug & Carpet Protector to help make it a bit more weatherproof. 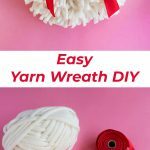 Yarn is delicate, so if your doorway doesn’t have some kind of overhang or a storm door and you think your wreath might get excessively wet, then it may not last long. But again, this kind of depends on your doorway. So use your best judgment here. Credits // Author and Photography: Emma Chapman. Photos edited with the NEW A Beautiful Mess actions. It’s like a giant pom pom ring. I love it! So cute!!! I love the cozy look of it. And seriously don’t feel bad about the leaves…we battle every year with our trees, they take forever to drop all the leaves and it starts snowing before we can get them all. And crafts are wayyy more fun then raking. I’m quite sad because this year I’m moving and therefore I can’t decorate my home 🙁 Love Christmas decoration! Thanks! And I totally agree, it was SO simple to make but I was really happy with the result. Easy to change up too with different colored yarn, ribbon, or other elements. I hadn’t thought of that, but you’re so right! It would work for V-day too. Such a cute and simple DIY! How do you come up with these cute DIYs? I love this one! It is informative blog.I need this information that you mentioned above.It is useful and helpful information to me.I am waiting to get more innovative ideas from your site. What a cute and simple idea, I love it! This is super cute! At first glance, I thought it was white chocolate strips! This looks amazing! and probably so simple to do. If I saw someone make a cute wreath from packing peanuts I would be super impressed! I hate those things and it feels like I have an excess right now from online (holiday gift) shopping. So annoying and I feel terrible throwing them away as our recycling can’t take them but it just feels like SUCH a waste. So, yeah, that was be impressive. It’s seriously the easiest thing ever-no crafting skills required. If you can cut yarn you can make this. I like this because in photos and, I imagine from far away, the wreath almost seems beach-like. Kind of like white coral. I can totally see this being a great wreath for someone who lives near the beach or has a beach themed home. Oooh I really like the look of that single ply yarn. Nice choice! This looks amazing! Such a simple but really effective DIY! Thank you for sharing this great information.In this post good explanation and in this post gives good tips that helpful for people. What size wreath did you use? Just wondering so I have a good idea of how much yarn to get. Thanks! I Believe in This. Well done for articles.